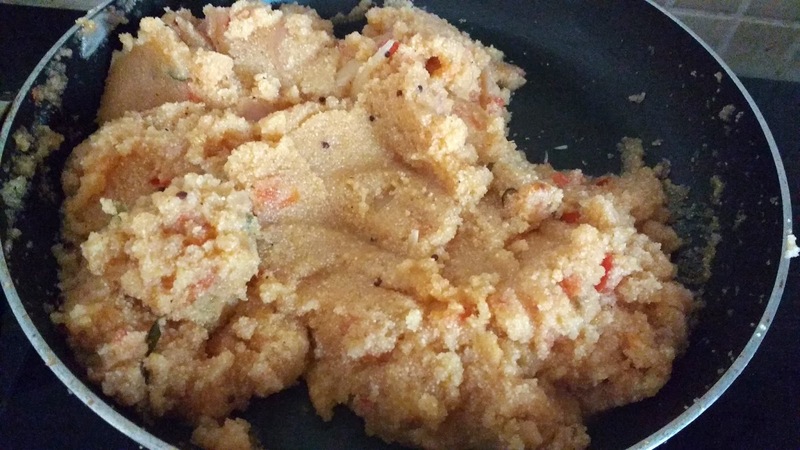 Rava Upma is one of the most popular breakfast recipes from South Indian cuisine. It is nutritious, delicious and easy to make. It is usually served with Coconut chutney, Onion-Tomato chutney or Sambhar/Rasam but you can consume it as it also. I personally like it with my all time favourite tomato ketchup. 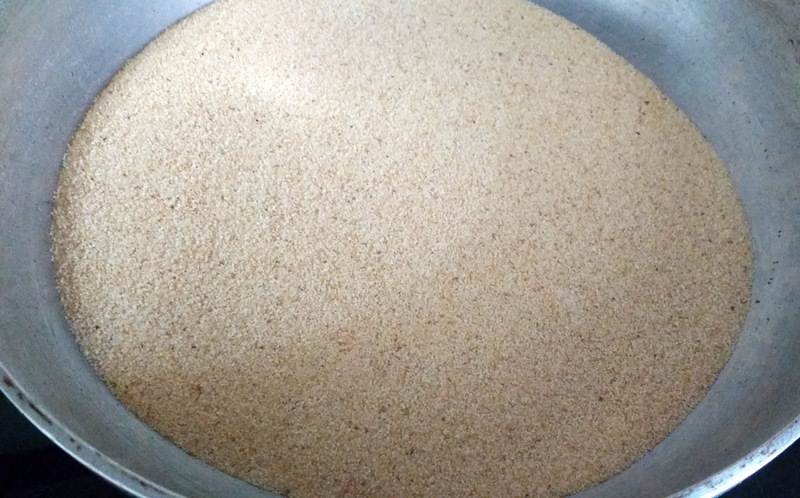 The core ingredient in this recipe is "Rava" which is also known by other names like "Sooji" or "Semolina". 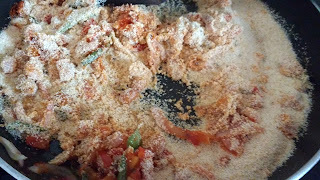 Today I am going to share the recipe for Onion-Tomato Rava Upma which will be towards tangier side. I have added curry leaves to the recipe as it not only gives a wonderful aroma but it is also very beneficial for skin and hairs. In general you can add any other veggies of your choice like capsicum, carrot, sweet corn or peas. You can even add Urad dal or chana dal for increasing its nutrition value. Rava upma is also a great option for giving in kids tiffin as it tasty, healthy and fulfilling at the same time. The preparation time for this dish is approx 30 minutes. However, if you dry roast the sooji well in advance and store it in container, preparing rava upma will not take more than 15-20 minutes. Dry roasting and storing the sooji is very helpful. It saves lots of time especially when you have to rush for your office in morning and don't have much time for preparing breakfast. Also, it increases the shelf life of sooji by saving it from mould or insects(generally caused by moisture). Add the Sooji to a heavy bottomed pan. Roast it on medium flame with intermittent flipping for around 10 minutes or till its colour changes to golden brown. Keep it aside. Heat oil in a pan. Add ginger paste and chopped onion to it. 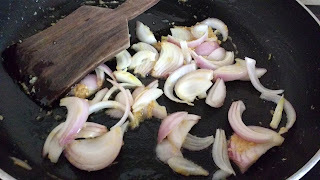 Sauté the onions till they turn pink in colour. Add peanuts and mustard seeds. Let them cook on medium flame for 2-3 minutes till the mustard seeds and peanuts start to crackle. Add curry leaves. Stir for few seconds. Add chopped tomatoes, tomato puree, red chilli powder and salt to the pan. Let it cook for 2-3 minutes. 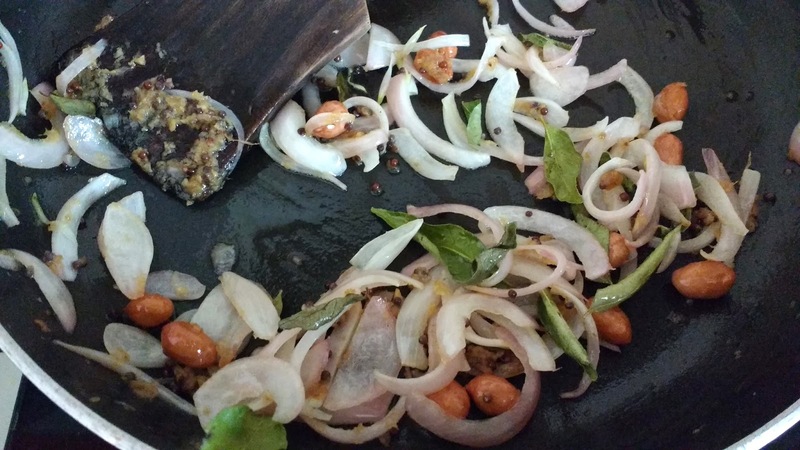 Add roasted sooji to the above prepared masala. Mix well. 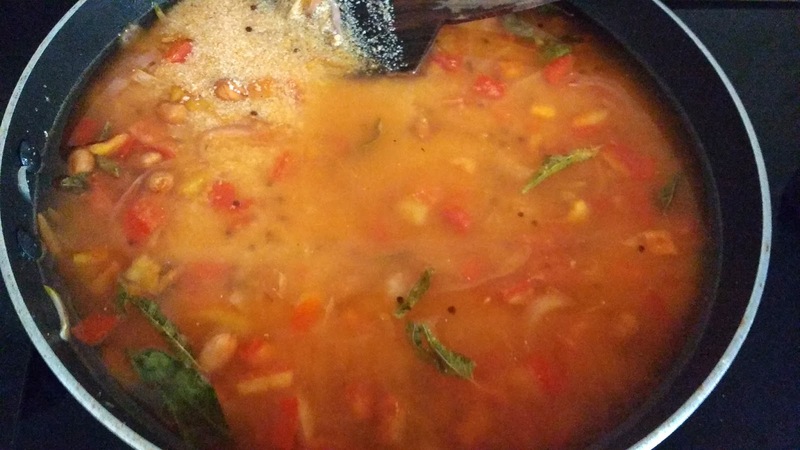 Add water and stir on high flame so that no lumps are formed. Once a boil comes, slow down the flame. Cook it till all the water is evaporated. 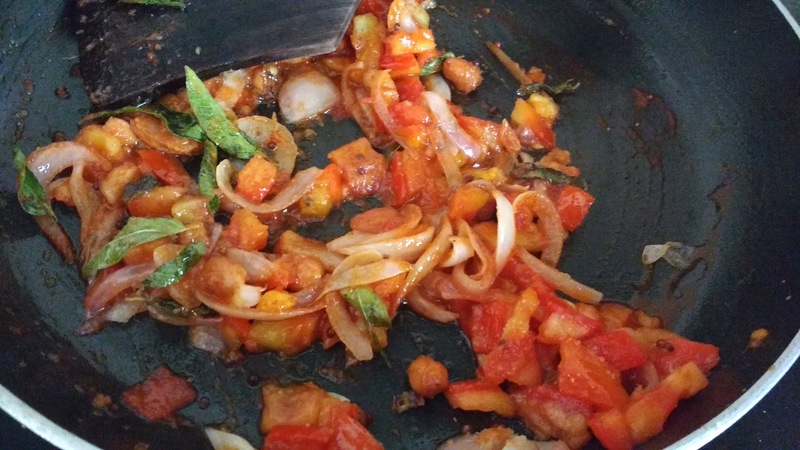 Place some chopped tomatoes/cashews/coriander leaves in the base of a flat bottomed bowl. Add above prepared upma to it and level with the help of a spoon. Wait for 1 minute. 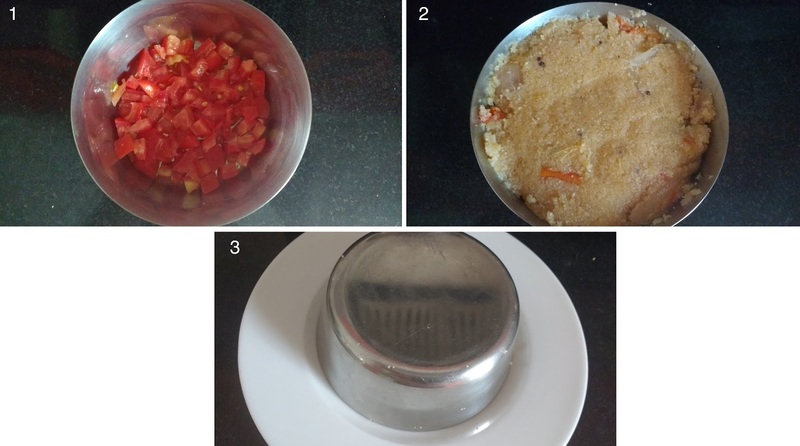 Gently separate the edges of upma from bowl with help of knife. Invert it over a plate. 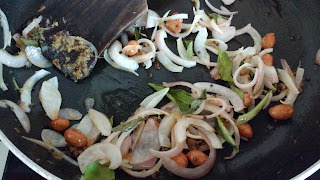 Garnish with some more nuts or coriander leaves. Enjoy hot steaming tangy upma for your breakfast or evening snack!! For coconut chutney recipe, click here and for onion-tomato chutney recipe click here.